This week we for our review we are hitting the road, the spice road. During our previous adventure to 401 Games for Cody's birthday we bought Century - Spice Road. Who could blame us, the hype over this game has been pretty crazy, in fact our LGS owner actually insisted that we get it, "If we only buy one game, this is the game". So as per usual, we committed!!! Century: Spice Road is a game that transports players back in time to the spice trading era. During this time, spices were a great commodity and the trading of spices could lead to great adventure and riches. This is the first game in a series of three games that are playable alone but also able to interact with each other, Century: Eastern Wonders (2018) was recently released, and the next game is said to be released in 2019. In Century: Spice road each player takes on the role of a caravan leader in the spice trade, competing to collect merchant cards (spice cards, upgrade cards, and trade cards), build up spice reserves (no more than 10), and trade spices for victory points to become the best caravan leader. The game is played over a series of rounds and ends in a two player game when a player gains five victory point cards. 1. Play: Play a Merchant card from your hand (players start with 2 standard Merchant cards). 2. Acquire: Acquire a Merchant card from the cards available, the first one is free, and each card after that costs a spice cube. 3. Rest: Place all previously played cards back into your hand. 4. Claim: Pay the required spice cube cost to buy victory cards. The game mechanics are centered around gaining cubes, converting them using Merchant cards to either gain more different spices or more spices. This game was definitely a great experience, with a quick setup, easy to understand rules, and quick game play it was definitely a good game. The quick setup and game play makes it a game that can easily hit the table and be play a couple rounds without feeling the effort that comes with other games. We loved the components, they were amazing, metal coins, cups to hold the spices, and beautiful artwork on the cards. The cubes were alright, but if you want something a little more shiny the Golem reiteration features gems instead. Another feature I really liked was the number of merchant cards, we have played a handful of games and each play felt rather different. In one game I got the exact combination of merchant cards required to get every victory card I wanted. 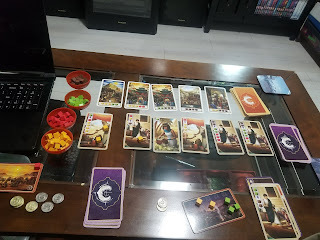 In another game there were no good merchant cards, and I kept buying more to try and open up better options and in the end I had a massive handful of merchant cards (none really helpful) and two victory cards, while Cody had all the Victory cards and money. The strategy for this game can vary a lot depending on the victory cards and the merchant cards available, so it is nice to have that replayability, especially with such a quick game. As for the criticism, my biggest complaint is the hype associated with the game. While the game was good (the components amazing), that's it, it was just good, not mind-blowing. The game had some tense moments - Cody and I would both be going for the same victory card and that made the game rather fun but other times there was little competition or even player interaction which made it a little dull. Sometimes I also found that it would be helpful to have a mechanism to reset the merchant cards, when nothing helps and there are no spice cards it can leave players rather stuck in a two player game. Overall we are fans, we just aren't shouting from the rooftops with microphones.